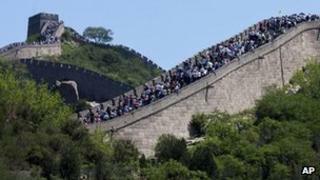 Beijing has announced that it will open two new parts of the Great Wall of China to meet high tourist demand. City officials told the state news agency Xinhua that the four parts of the wall currently open to the public are overcrowded on weekends and holidays. Tourists have reportedly responded by scaling the walls of the closed sections, damaging their structure. The authorities will now open the Huanghuacheng and Hefangkou areas. Beijing's municipal government will also expand the Mutianyu and Badaling sites in the city's northern suburbs. China recently announced the results of a state survey which found the Great Wall is considerably longer than first thought. According to the study, which was reported on Xinhua, the wall is 21,196.18km (13,170.70 miles) long, rather than an estimate of 8,850km given in a 2009 study. Work started on the Great Wall in 500BC to protect China's northern border, and it remains the world's largest man-made structure.